Tri Fold Brochure Design, Tips and Tricks | WhatsTheBigIdea.com, Inc. In the graphic design and printing industries, brochures come in many shapes and sizes. Brochure design can include a wide variety of different formats, though the most popular is the tri-fold, which is typically scored and folded in two places, creating three or six (6) separate panels for your design and text. The position, direction, and width of fold determines the orientation and size of the area which will contain your artwork. Need a Brochure Design Quote? The choice of how and where you decide to fold your brochure is virtually limitless though veering too far from the standardized trifold format will increase the price of the printing. Most commercial printers do offer custom scoring for brochures, though it may require special pre-press and setup. Even with the added costs, if you are in search of a unique idea that will help your company brochure stand out from the crowd, you may want to incorporate an irregular fold. Examples of several different brochure folds. The only restraint is your imagination and the creativity of the brochure designer. 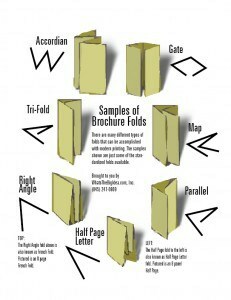 In the printing industry, trifolds can also be referred to as z-fold, accordion, barrel or roll folded layout designs. Generally, a trifold format is preferable over other brochures because it is easily distributed, versatile and affordable to produce. A standard trifold measuring 3.66″ x 8.5″ can be mailed in a standard #9 envelope, placed in a display or brochure rack and used in a variety of different ways to add residual value. For example, below are some complementary uses for your brochure that will keep your message in front of your audience longer. The idea is to keep your newly designed brochure out of the “Round File” (aka trash) and in the hands of its reader longer. In order to do that, you should consider implementing an ancillary or supplementary uses for the brochure. Adding an additional function to your brochure design, will increase its effectiveness. The goal of your new brochure design, regardless of size, folds and use is to increase awareness and entice its reader to respond. Trifold brochures have become a staple for businesses which need to increase sales at an affordable price. Printing prices have never been more affordable and printers more prolific as technologies enable a more competitive marketplace. Although the printing choices may be numerous, there are few trifold brochure designers with as much experience and professionalism as WhatsTheBigIdea.com. So before you make the final decision as to which graphic design firm will design your company brochure, keep in mind that price is important though it should not be your deciding factor. Give me (David) a call at (845) 247-0909 to help answer the questions you may have and for a free brochure design quote.